Combine our team of veteran IBM programmers with their younger .NET and mobile app developer counterparts, and the result can be game changing. 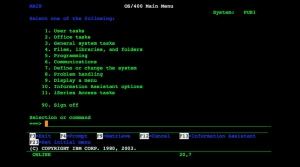 The IBM i-Series and it’s parent – the AS/400 – remain in widespread use today, and for good reason. Their reliability is legendary. They’ve proven to be virtually impervious to predatory attacks. They host thousands of time-tested business applications. That said, there are shortcomings. In their day, these machines presented data like every other system – in a tabular, alphanumeric format. As PC client-server systems took over, modernization of these legacy systems’ user interface stalled. While connectivity to PCs, and even the Internet, was developed, today’s need for dashboards and remote users operating via mobile apps were not even envisioned. If you’re “true-blue,” we have a question for you: What if you could keep your box for all of the great qualities it offers, PLUS offer your users a rich, graphical Business Intelligence layer AND a modern, integrated mobile app? Our CAP-View-i and CAP-Connect-i frameworks are making this a reality. Through connected Microsoft servers, we enable dynamic, bi-directional communication that ensures executive and field sales and service teams have secure access to critical corporate data, even when wi-fi and cellular networks are unavailable. AS/400 modernization just makes sense for businesses with solid, proven applications and infrastructure in place. Our Microsoft .Net and mobile app development teams, combined with our grayer veterans transform this proven platform, making it competitive – and more importantly, secure – in today’s demanding business climate. And our CAP-View-i and CAP-Connect-i frameworks make it quick and cost-effective.